Made in Sydney, New South Wales, Australia, 1988. This platinum record award has significance as evidence of the record sales achieved by the band the Cockroaches, as an illustration of the origins of the Wiggles, and as part of the story of Regular Records. Formed in 1979, the Cockroaches were a Sydney-based pub rock band that included the Field brothers (John, Paul and Anthony) and Jeff Fatt on keyboards. They released a number of singles before signing with Regular Records in 1986. 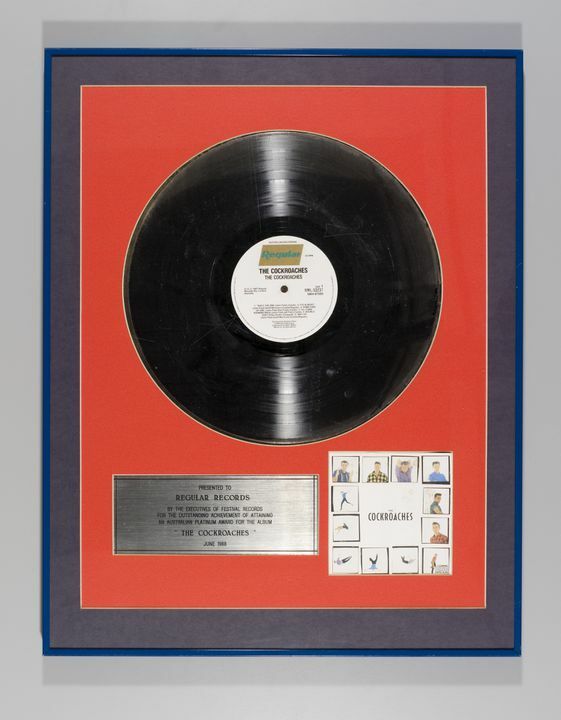 Platinum record award in blue metal frame with composite board backing. Dark blue mount. Silver coloured LP disc with Regular Records label, on red background. Acrylic cover. Plaque on lower left side with text 'Presented to Regular Records by the executives of Festival Records for the outstanding achievement of attaining an Australian platinum award for the album The Cockroaches, June 1988'. Lower right side has the paper CD cover mounted, showing colour photographs of the band members. Metal cord attached to reverse for hanging. Made by Festival Records for Regular Records. The award was lent to the Museum for display in the exhibition 'Spinning around: 50 years of Festival Records' and subsequently donated to the Museum.